Coachella marks the start of fashion festival season. And while the music *officially* takes center stage, festival fashion has been drawing more and more attention over the last few years. It’s a great excuse to show off your personality and maybe don an outfit that wouldn’t be considered acceptable at your 9 to 5. Below I share my favourite trends that will help you stand out from the crowd. Like it or not, tie-dye is back baby! I love this white denim look with tie-dye jacket, but the real scene stealer is these snakeskin booties in seafoam green. Closed toe footwear is always a good idea if you’re someone who likes to be front and center at a concert, and a clear bag is not only super on trend but may just help you skip to the front of the security line. These denim overalls aren’t just durable, they are also versatile which is super important when traveling for a festival. You can style them so many ways, meaning you don’t take up too much valuable retail space in your suitcase. The addition of a crochet kimono gives the look boho chic vibes, and a bag which can transition between crossbody and backpack guarantees you can always rock out hands-free. If you like to observe the shows from a VIP lounge, these snakeskin shoes are absolute perfection. Denim on denim on denim! 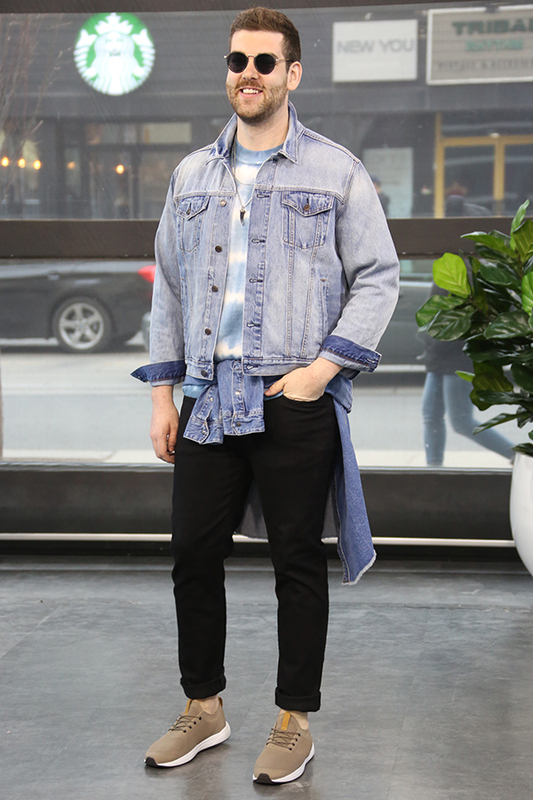 Guys should always own at least one denim jacket, and the trend this year is an additional layer tie around the waist. Don’t forget that men can have fun with accessories too as evidenced by this super fun horn necklace. You don’t have to grow up in the ’60s to love this dress. It not only boasts a stunning print patchwork, but all the details you want in a festival dress (think slits, cutouts, and billowy sleeves). This one is guaranteed to be on your Instagram feeds this season.